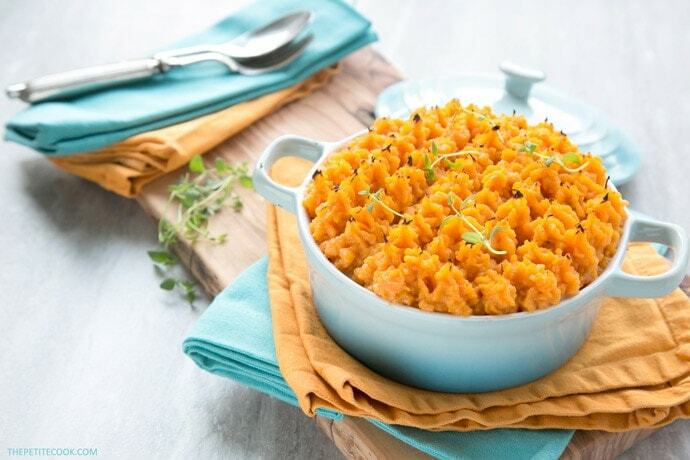 This Sweet Potato Chicken Cottage Pie is a super easy healthy take on one of the most popular British comfort foods – Ready in 30 min, gluten-free and packed with extra veggies! I’m currently in Germany (where I have a second home) and let me tell you, it’s absolutely FREEEEEZING here. So I find myself craving more comfort foods than I usually do, and this pie is the perfect example. Shepherd’s pie or cottage pie is a meat pie topped with a crust of mashed potato. As good as it is the traditional version, I’ve completely fallen in love with this healthier awesome alternative. Plus, it’s awesomely gluten-free, in case you have dietary requirements you need to follow. This heart-warming Sweet Potato Chicken Cottage Pie is super easy to put together. 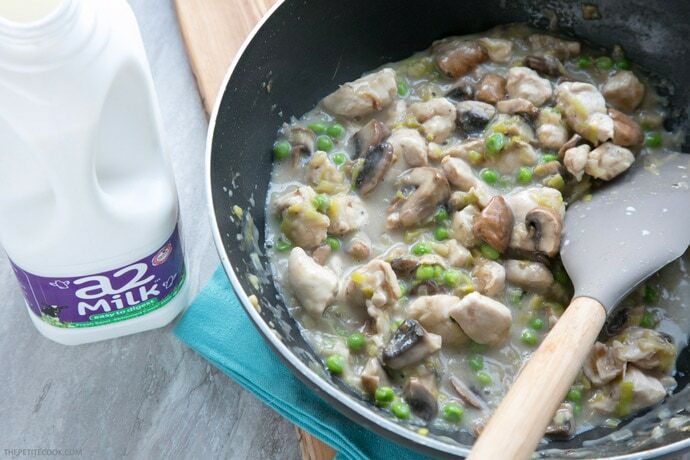 It takes less than 30 min to make start to finish, and only requires few simple ingredients such as chicken breast, sweet potato, leek, mushrooms, peas, flour, milk, stock and fresh aromatic herbs. Instead of using minced beef/lamb, I opted for chicken breast bites, to add some chunky texture to the mix (you can go for homemade chicken mince too). You may use your favorite veggies for the filling. Don’t like mushrooms & peas? Opt for broccoli, carrots, green beans, or all three. Don’t fancy leeks? Switch for onions or shallots. Just use as many veggies as you like – sky is the limit! To make things lighter and healthier, I usually go for a little homemade butter and a glug of olive oil. I’ve also switched the heavy cream traditionally used for the white sauce, with vegetable stock and a2milk semi-skimmed milk. I’ve been collaborating with this award-winning milk brand for a few years now, and cannot recommend it enough. A2milk is easier to digest than normal cow milk, and is super gentle to your tummy. As you know I’m dairy intolerant, but have enjoyed a2milk for a long time now, without suffering the painful effects I had before with other cow milk/dairy products (bloating, stomachache, just to name a few). 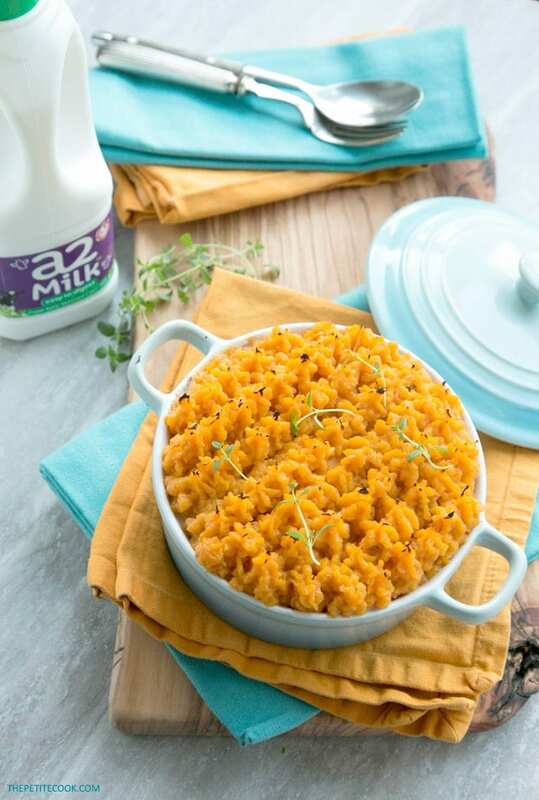 Perfect all winter-long, dig into a deliciously creamy white sauce, with juicy succulent chicken topped with a fluffly sweet potato mash – This Sweet Potato Chicken Cottage Pie is comfort food at its best! Heat the oven to 180C / 350F. Heat a large skillet with the olive oil over medium heat. Fold in chopped leek and mushrooms and cook until slightly soften, about 2-3 min. Add in the chicken breast chunks, and brown the meat for a further 2 min on both sides. Season with salt and pepper. Add in butter and frozen peas, and sprinkle the flour all over the mixture. Gently pour in the stock while mixing, then pour the milk in too. Add thyme leaves, lower the heat and simmer for about 10 min, until the sauce has thickened and reaches a creamy consistency. Season with salt and pepper to taste. While the sauce cooks, steam the sweet potato chunks for about 10 min, until soften. Transfer into a large bowl, and mash with a potato masher, slowing incorporating the milk in. Season with salt and pepper. When the chicken filling is cooked through, transfer to an ovenproof dish, top with the mash and ruffle with a fork. Bake for 10 mins, until slightly browned and crunchy on top ( you may also put it under the grill to brown, if you like). Serve nicely hot straight from the oven. I used rice flour to make the pie gluten-free, you may of course use all purpose flour if you don't have any dietary restrictions. This post is sponsored by a2Milk. I am a huge fan of this brand and I’m really proud to collaborate with their team. I use a2Milk regularly and I can’t recommend it enough. Thank you for supporting the brands that support The Petite Cook! this looks so delicious! My husband hates mashrooms, so I never make Frittata’s which is a shame. Have you tried freezing this or something similar. I’m thinking for my breakfast or lunch, I could make ahead. Let me know, much appreciated! Cottage pie is my favorite, especially closer to St. Patty’s day! I’ll have to try it with sweet potatoes, that’s a great twist! Can you believe the only Shepherds Pie I have ever had was in Kenya. It was during a rhino research project I had hooked up with and was cooked by an African tribesman for the European scientists staying at the camp. How crazy is that? Anyhow, I’m loving your version with the sweet potato topping. Way tastier and way more attractive in my book. I love Shepherd’s Pie so I bet I would love this!! Your cottage pie looks delicious, I love the idea of using sweet potato and chicken pieces instead of minced beef. I usually make a vegetarian cottage pie as I’m not keen on minced beef but now I can try your recipe for a change. Thanks for sharing. Big fan of cottage pies and this one really looks delicious and that too easy to make. And adding that healthy twist to it is always welcomed. I love this idea, it’s somehow a nice healthy twist to a traditional dish… Although I’m sure in Germany shepherd’s pie are so not typical. I ll make this for my german husby who loves sweet potato! Great dish! I have never made a cottage pie. We love meat pies, which this is …. but with potatoes instead of a traditional crust. This would make great leftovers for another delicious meal during the week. Perfect comfort food for the cold, winter season. Thank you so much for providing a skinny version to a classic dish. Sometimes, I get scared to try some of my favorite recipes as they are loaded wit fat and carbs. This one looks amazing. Loved the pics as well. 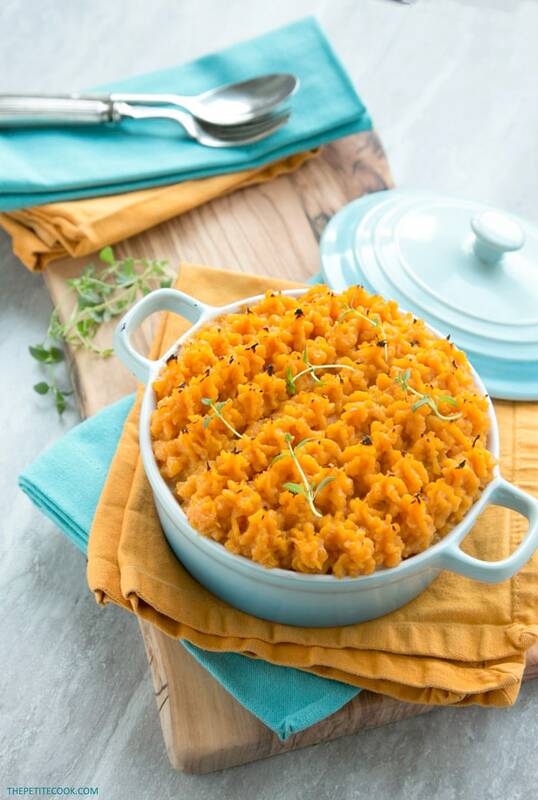 I love the sweet potato topping on this – makes it so much more colourful and at the same time healthier than a traditional cottage pie! I LOVE finding skinny versions of all my favorite foods and this recipe for skinny shepard’s pie sounds so delish! What a great way to pack in more vitamins and nutrients with the sweet potato topping instead of the traditional mashed, love it! Thanks for a great recipe! This really looks good, I gotta try it. My wife would love it! Thanks for sharing! I would have never thought of using chicken, this is a completely different spin. Interesting. Lovely, bright pictures as usual. Thank you so much for your lovely feedback Solange, it made my day 🙂 I’m trying to eat less red meat these days, so I thought chicken could have been a great alternative for this cottage pie. Let me tell you, it was even better than the traditional version! This is definitely my kind of cooking. I love chicken fillings for pies and even with pasta, and I know I’d love it with a sweet potato topping like this. 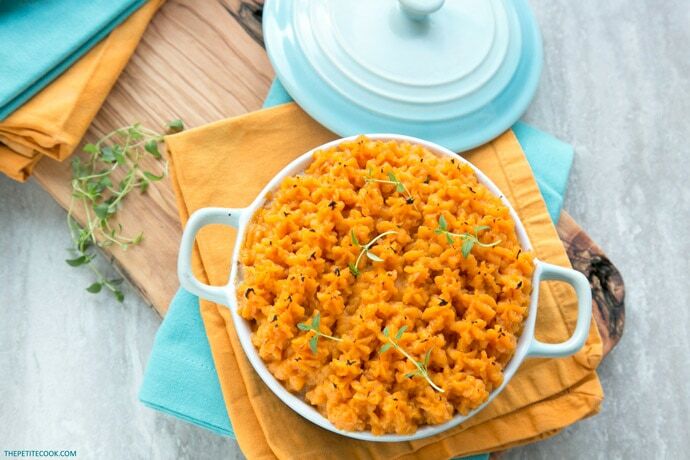 This recipe looks divine – I love sweet potatoes, will need to try it soon.